Ask fellow campers about "Bladon Springs County Park" and nearby attractions. We visited the park, but did not stay overnight. We found no sign of any caretaker, host, etc., and no sign indicating there was a camping fee. Phone numbers of two people in the county were provided on signs. It may be free. Campsites were mowed, and water spigots were operating. Could not test for electric service, but when I raised the unique panel lids, large, aggressive, and active paper wasp colonies were present. There were a number of odd bath houses with pitcher pump wells, and a several large group picnic facilities, all well maintained. As for camping, however, because of the remoteness, lack of a host or park manager, and the possibility of being totally alone in a very dark place, I would say to those who may consider camping here that you may be placing yourself in an unsafe environment for your property and possibly your life by staying overnight. Again, my opinion is that this unmanned, remote, and dark county park places an RVer at significant risk of being robbed, at minimum. I cannot recommend this Park to my fellow RVers. We camped at Bladon Springs County Park in a Travel Trailer. We were passing through the area and needed a roosting spot. We came into the park at about 5pm on a Sunday afternoon. No one was there--no other campers, no park employees. We selected one of the dozen or so pads. They were all level with full hookups. No shade. The 30 amp breaker tripped a couple of times during the night, and that was a bit eerie in a deserted park where you are the only campers. I cautiously went out to reset. Next morning no employee had arrived by 9am. I called the park number and was routed to park HQ in Montgomery. They asked me to kindly leave a check in the mail box. I thought it was a novel experience being all alone in the middle of no where but my wife was not comfortable with it. I think this park gets active in hunting season. It has a big deer dressing station. The park has a good history display board explaining its origin as a sulfur springs resort, and the old Roman baths built before the Civil War are still there to look at. We camped at Bladon Springs County Park in a Travel Trailer. We stayed here on our way to Florida from Texas. We wanted to stay off freeways. This place is remote. We had a pleasant overnight stay, we were the only ones here. We got here, picked out a spot and hooked up. We were here an hour or so before the manager came to collect. He was very pleasant. There are springs here. There is a settlement of homes nearby so we could hear activity but we could not see anything due to the trees. They locked the gate at dark but the manager gave us the combination in case of emergency. I did not see any shower building. I saw what appeared to be a pit toilet only. 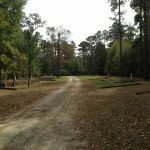 We camped at Bladon Springs County Park in a Motorhome. We did not stay here. The lots were narrow, not made for slide outs and difficult to back into. The park was quiet, no campers just a picnic group at the pavilion. Once the site of a lavish health spa in the early 1800's, only a few wells with hand-pump remain. The spring water contains sulfur, iron, magnesium, and calcium. 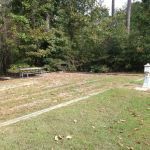 We camped at Bladon Springs County Park in a Travel Trailer. I arrived here at the end of March, 2006 on a Friday and was the only person in the whole park! The ranger arrived just at dark and collected the money. The bathrooms were a bit far from the camping area itself (maybe 300 feet away) with no showers or other amenities not noted above. The park itself is nice and perfect for a night away from any hiway noise or city lights. There are natural springs here that were used many, many years ago as healing springs. The GPS coordinates for the campground are: N31d44.267 W88d11.778 We camped at Bladon Springs County Park in a Tent Trailer. 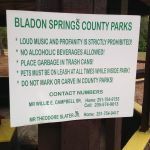 Are you affiliated with Bladon Springs County Park ?